Below is a list of different sugar substitutes. Some natural sweeteners are more nutrient dense than others. I do want to warn you... even if something says "natural" on the label does not mean it is good for your body. Each individual body is different on how it metabolizes sugar. Your body's response to sugar will depend on how "damaged" it is in the first place. By "damaged", I mean how do your cells react when your insulin levels spikes. Working at a “healthy” smoothie bar, I noticed that most of the smoothies contained quite a bit of honey plus fruit swimming in lots of added sugar/syrups. In all honesty... the fruit smoothies were extremely high in refined sugars. Unsweetened fruit was available. Unfortunately, most of the customers did not know about that option. One cup of strawberries in syrup contains 234 calories, and 55.4 grams of sugar! 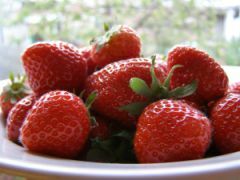 But when you take 1 cup of fresh, sliced strawberries you get 53 calories and 8 grams of sugar. Say you only switch to using fresh or unsweetened frozen strawberries in your smoothie every day from the sugar-filled strawberries. That little change could help you lose 18 pounds in a year! You probably know about some of the horrible side effects of sugar, such as the dreaded weight gain. But the dangers of sugar are not limited to just extra fat on your frame. Open your eyes and see how sugar side effects can destroy your health. #1 – The fruit itself! God has given us a desire to be drawn to sweet foods. He made fruit to specifically meet that desire naturally. We are just bombarded with over-the-top sweet, processed foods today that make eating a juicy, crisp apple a chore. Learn to drink fruit smoothies without the stimulating sugars added. When partnered with a healthy low-processed diet, you will be surprised at how quickly your taste buds will become adjusted to the subtle, yet delicious, flavors of fruit. When choosing fruit, look for the fruit in season. Fully-ripened fruit contain a burst flavor that cannot be compared. #2 – I do understand if you need the added sweetness. The next best natural sweetener of the entire list would be stevia. Stevia is naturally sweet and contains no calories and sugars. It is a tasty way to add sweetness to your fruit smoothie without the extra 60-200 unneeded calories and sugar spike. In my personal experience, I can only use Stevia and Xylitol on a regular basis. As my blood sugars react too much with the other options listed below. Please keep in mind that these natural sweeteners are listed in alphabetical order and not in order of health benefits. 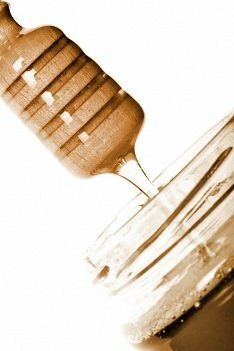 Raw Honey - Check out the health benefits of honey! Stevia - Check out four amazing benefits of stevia.